Korg’s SDD-3000 captures the sounds of U2’s the Edge in a programmable delay pedal, and now you can save big on this versatile digital unit. Sweetwater is offering a phenomenal $170 off the original price, bringing the total down to $229 from $399. 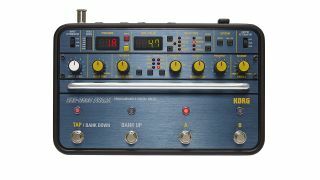 Based on the original SDD-3000 rack unit, as used by the Edge, the SDD-3000 Pedal features eight delay types, five modulation waveforms and full MIDI integration. As we noted in our review, it’s “one extremely versatile and classy delay pedal that could take care of all your stage and recording needs”. If you like the looks of this one, you’d best get a move on, though, as it’s a closeout deal, so stocks are likely to be limited.